The Digital Research Library of Illinois History Journal™: The 1968 Illinois Earthquake, a "New Madrid Fault event," was the largest recorded earthquake in the state of Illinois. The 1968 Illinois Earthquake, a "New Madrid Fault event," was the largest recorded earthquake in the state of Illinois. Striking at 11:02 a.m. on November 9, 1968 it measured 5.4 on the Richter scale. Although there were no fatalities, the event caused considerable structural damage to buildings, including the toppling of chimneys and shaking in Chicago, the region's largest city. The earthquake was one of the most widely felt in U.S. history, affecting 23 states over an area of 580,000 square miles. Isoseismal map for the 1968 Illinois event. I–III are Not felt; too Weak, IV is Light, V is Moderate, VI is Strong, VII is Very strong. In studying its cause, scientists discovered the Cottage Grove Fault in the Southern Illinois Basin.Within the region, millions felt the rupture. Reactions to the earthquake varied: some people near the epicenter did not react to the shaking, while others panicked. 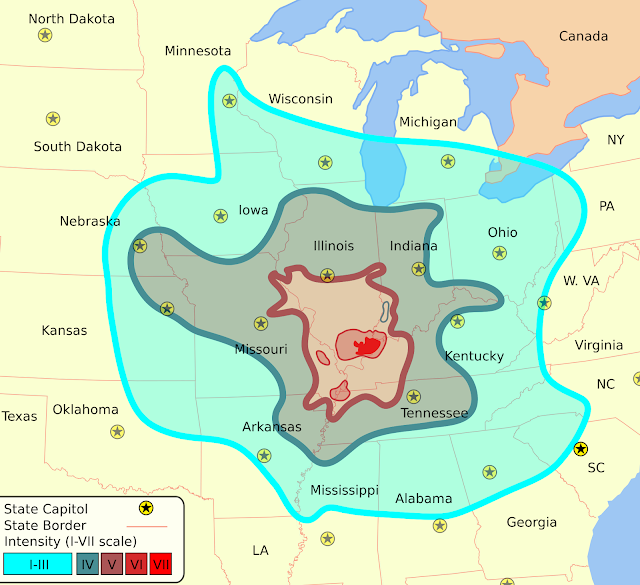 A future earthquake in the region is extremely likely; in 2005, seismologists and geologists estimated a 90% chance of a magnitude 6–7 tremor before 2055, likely originating in the Wabash Valley seismic zone on the Illinois–Indiana border or the New Madrid fault zone.The first recorded Illinois earthquake was from 1795, when a small earthquake shook the frontier settlement of Kaskaskia. Data from large earthquakes—in May and July 1909, and November 1968—suggest that earthquakes in the area are of moderate magnitude but can be felt over a large geographical area, largely because of the lack of fault lines. The May 1909 Aurora earthquake affected people in an area of 500,000 square miles; the 1968 Illinois earthquake was felt by those living in an area of about 580,000 square miles. Contradicting the idea that the region's earthquakes are felt over a wide area, a 1965 shock was only noticed near Tamms, even though it had the same intensity level (VII) as those of 1909 and 1968. Before 1968, earthquakes had been recorded in 1838, 1857, 1876, 1881, 1882, 1883, 1887, 1891, 1903, 1905, 1912, 1917, 1922, 1934, 1939, 1947, 1953, 1955, and 1958. Since 1968, other earthquakes have occurred in the same region in 1972, 1974, 1984, and 2008. The quake struck on Saturday, November 9, 1968, at 11:02 a.m. The quake's epicenterwas slightly northwest of Broughton in Hamilton County, and close to the Illinois–Indiana border, about 120 miles east of St. Louis, Missouri. Surrounding the epicenter were several small towns built on flat glacial lake plains and low hills. Scientists described the rupture as "strong". During the quake, surface waveand body wave magnitudes were measured at 5.2 and 5.54 respectively. The magnitude of the quake reached 5.4 on the Richter scale. The earthquake occurred at a depth of 16 miles. A fault plane solution for the earthquake confirmed two nodal planes (one is always a fault plane, the other an auxiliary plane) striking north–south and dipping approximately 45 degrees to the east and to the west. This faulting suggests dip slip reverse motion and a horizontal east–west axis of confining stress. At the time of the earthquake, no faults were known in the immediate epicentral region, but the motion corresponded to movement along the Wabash Valley Fault System roughly 10 miles east of the region. 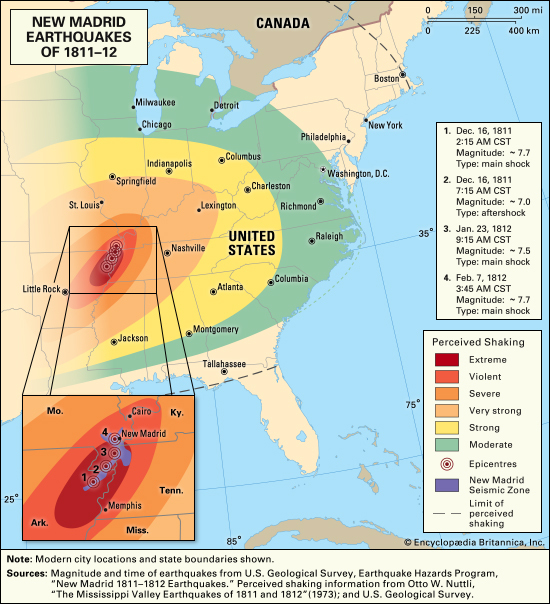 The rupture also partly occurred on the New Madrid Fault, responsible for the great New Madrid earthquakes in 1812. The New Madrid tremors were the most powerful earthquakes to hit the contiguous United States. Various theories were put forward for the cause of the rupture. Donald Roll, director of seismology at Loyola University Chicago, proposed that the quake was caused by massive amounts of silt being deposited by rivers, generating a "seesaw" effect on the plates beneath. "The weight of the silt depressed one end of the block and tipped up the other," he said. However, scientists eventually realized the cause was a then-unknown fault, the Cottage Grove Fault, a small tear in the Earth's rock in the Southern Illinois Basin near the city of Harrisburg, Illinois. The fault, which is aligned east–west, is connected to the north–south trending Wabash Valley Fault System at its eastern end. Seismographic mapping completed by geologists revealed monoclines, anticlines, and synclines, all of which suggest deformation during the Paleozoic era, when strike-slip faulting took place nearby. The fault runs along an ancient Precambrianterrane boundary. It was active mainly in the Late Pennsylvanian and Early Permian epochs around 300 million years ago. In 2005, scientists determined there was a 90% probability of a magnitude 6–7 earthquake in the New Madrid area during the next 50 years. This could cause potentially high damage in the Chicago metropolitan area which has a population near ten million people. Pressure on the fault where the 1811–1812 Madrid earthquakes occurred was believed to be increasing, but a later study by Eric Calais of Purdue University and other experts concluded the land adjacent to the New Madrid fault was moving less than 0.0079 inches a year, increasing the span between expected earthquakes on the fault to 500–1,000 years. Scientists anticipating a future earthquake suggest the Wabash Valley Fault as a possible source, calling it "dangerous".